Brigidine Sisters offer their congratulations to all members of the Missionary Society of St Columban as they mark the beginning of the centenary year of their mission. In 1918 the Bishops of Ireland gave permission for this missionary initiative to be founded and in 1920 the first group of Columban missionaries set out on mission to China. Now members of the Columban Society live and serve in sixteen countries around the world. 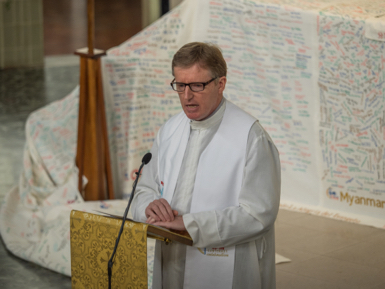 In his homily on this occasion, Fr Kevin, who completed his primary education with Brigidine Sisters in Geelong, Victoria is reported as saying: “With God’s grace and God’s missionary imagination, all involved in Columban mission over the past 100 years have listened to the word of God, have discerned the ‘signs of the times’ through the movement of the Holy Spirit in the life of the church and in the world, and responded courageously and creatively to do the will of God”.